Western blot analysis of extracts from various cell types using eIF3J Antibody. 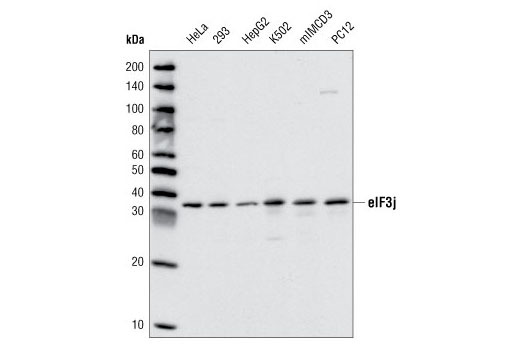 eIF3J Antibody detects endogenous levels of total eIF3J protein. Polyclonal antibodies are produced by immunizing animals with a synthetic peptide corresponding to the sequence of human eIF3J. Antibodies are purified by protein A and peptide affinity chromatography. Translation initiation requires a set of factors to facilitate the association of the 40S ribosomal subunit with mRNA. The eIF4F complex, consisting of eIF4E, eIF4A, and eIF4G, binds to the 5' cap structure of mRNA. eIF4F and eIF4B unwind the secondary structure of mRNA at its 5' untranslated region. The 40S ribosomal subunit, along with some initiation factors including eIF3, then binds to the 5' mRNA cap and searches along the mRNA for the initiation codon. eIF3 is a large translation initiation complex with 10 to 13 different subunits. eIF3A, eIF3B, eIF3C, eIF3E, eIF3F, and eIF3H are the core subunits critical for the function of this complex. eIF3 physically interacts with eIF4G, which may be responsible for the association of the 40S ribosomal subunit with mRNA (1). eIF3 also stabilizes the binding of Met-tRNAf.eIF2.GTP to the 40S ribosomal subunit and helps keep the integrity of the resulting complex upon addition of the 60S ribosomal subunit (2). Studies have shown that mTOR interacts with eIF3 directly (3,4). When cells are stimulated by hormones or mitogenic signals, mTOR binds to the eIF3 complex and phosphorylates S6K1 (3). This process results in the dissociation of S6K1 from eIF3 and S6K1 activation. The activated S6K1 then phosphorylates its downstream targets including ribosomal protein S6 and eIF4B, resulting in stimulation of translation. Further findings demonstrated that activated mTOR signaling induces the association of eIF3 with eIF4G upon stimulation with insulin (3). One of the smallest subunits of eIF3, eIF3J, is critical in 40S initiation complex assembly (5). eIF3J has been shown to associate with the aminoacyl site and mRNA entry channel of the 40S ribosomal subunit (6). eIF3J has also been shown to have an additional role in the recycling of post-termination complexes (7). Masutani, M. et al. (2007) EMBO J 26, 3373-83. Chaudhuri, J. et al. (1999) J Biol Chem 274, 17975-80. Holz, M.K. et al. (2005) Cell 123, 569-80. Harris, T.E. et al. (2006) EMBO J 25, 1659-68. Fraser, C.S. et al. (2004) J Biol Chem 279, 8946-56. Fraser, C.S. et al. (2007) Mol Cell 26, 811-9. Pisarev, A.V. et al. (2007) Cell 131, 286-99.